Seattle-based developer Urban Renaissance Group is interested in purchasing in the Oregonian Publishing Buildings at 817 SW 17th Ave, according to a story in The Oregonian. 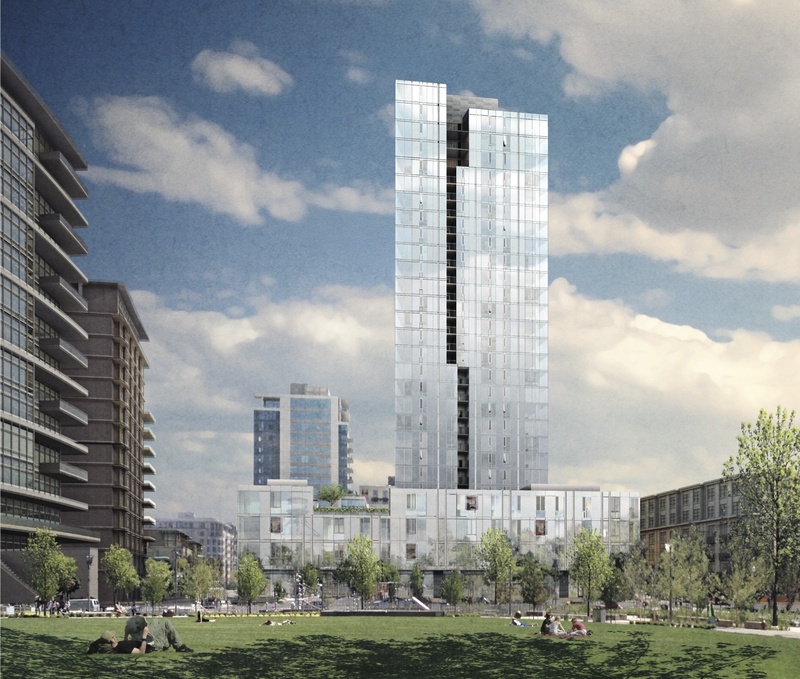 Working with GBD Architects, the developer is looking at a two block project that “would range from 86 feet to 160 feet in height”. The Willamette Week reported that “Portland’s scorching-hot apartment rental market may finally be cooling down—at least at its upper reaches.” The recently completed Block 17 apartments are currently offering six weeks of free rent, in order to help fill the 166 vacant units in the 281 unit building. 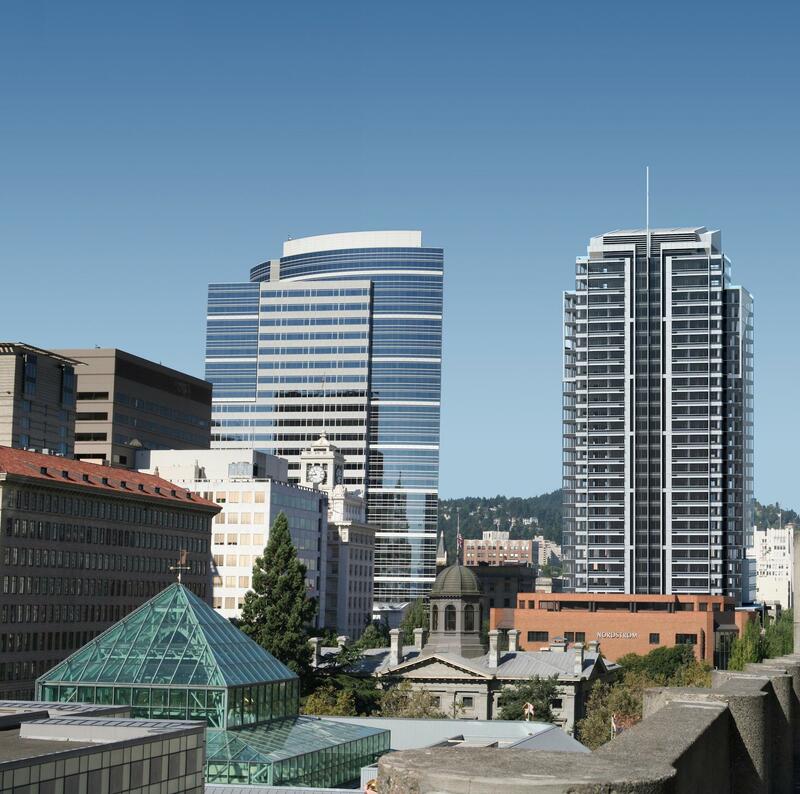 The Oregonian wrote about how “big out-of-town money” is buying up Portland rentals. 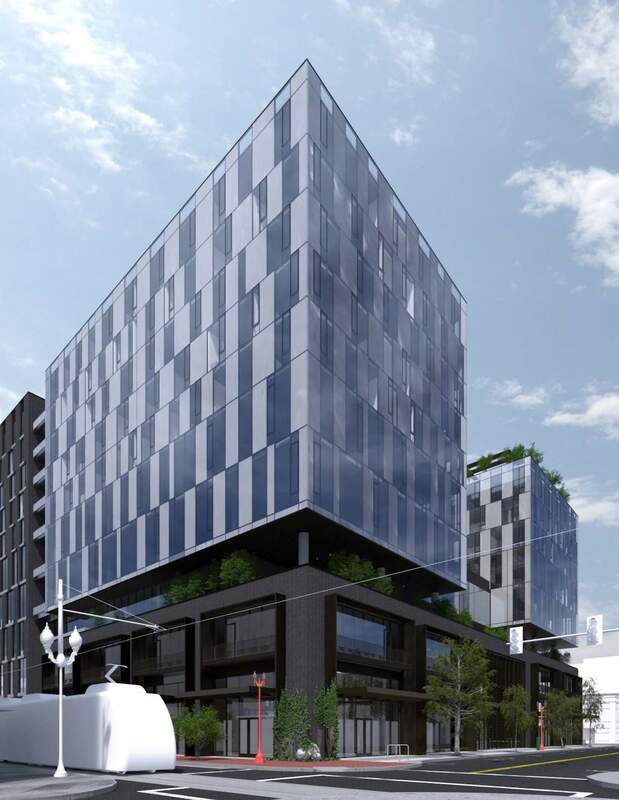 The Planning and Sustainability Commission declined to recommend a proposal to add parking minimums for new development in the Northwest Plan District, reported Portland Shoupistas. FamilyCare Health will contribute $2 million to the Asian Health and Services Center in Lents Town Center, according to a story in the Portland Business Journal. An article in the Portland Tribune questioned whether the planned capacity of the PSU Viking Pavilion will be enough. Original plans for the project in 2012 were for a 5,000 seat facility. As now envisioned the arena will seat between 3,000 and 3,100. The Hollywood Star News wrote about the City Council’s unanimous approval of the N/NE Neighborhood Housing Plan, a “five-year plan for investing an additional $20 million in tax increment financing funds from the Interstate Corridor Urban Renewal Area”. There are few neighborhoods in Portland that have seen more changes in recent decades than the Pearl District. Today the Pearl has evolved from what The Oregonian described in 1994 as “a decaying portion of Northwest Portland once devoted to industry and transportation” into a mixed-use neighborhood with thousands of residents, large offices and numerous shops and restaurants. Despite the huge changes, architects and developers working in the early phases of large development in the neighborhood were often responding to the historic context of one of Portland’s older neighborhoods: Couch’s Addition was platted in 1842; the North Park Blocks were acquired by the City in 1869; and many of the warehouses in the NW 13th Ave Historic District date back to the early 20th Century. Developments such as the Brewery Blocks or the Ecotrust incorporated historic buildings, while new condominiums mimicked their aesthetic. While little of the industry that once defined the area is left today, one of the charms of the neighborhood is the juxtaposition of high rises such as the Casey and historic low rises such as the Bullseye Glass Building. Further north in the Pearl there was less context to respond to. Much of the developable land was former railway yards, and the warehouses along NW 13th Avenue were more often single-story concrete structures rather than charming brick buildings. As development started to cross Lovejoy—once an elevated ramp leading to the Broadway Bridge—planners and neighborhood activists started to wonder if the North Pearl might develop in a different way. Instead of the bulky full block developments that had been built on some blocks south of Lovejoy, it was proposed that the developers might be allowed to build taller, but narrower. In 2008 the Zoning Code was amended to incorporate a provision that exists nowhere else in the City: in the North Pearl Height Opportunity Area there are no maximum building heights for buildings with narrow floor plates. This post is the third in a series on the high-rises currently under construction in the North Pearl. See also Part I about the Cosmopolitan on the Park and Part II about The Overton. 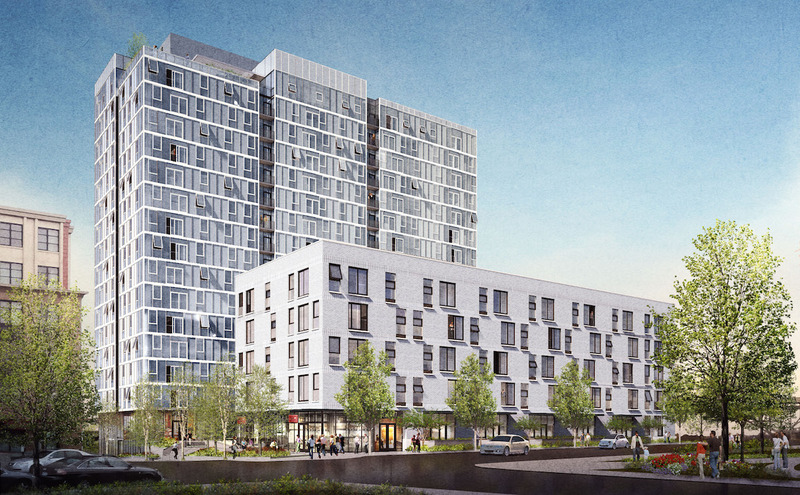 At 178′ tall, Block 17 would dominate almost any other neighborhood in Portland, and yet it is the shortest of the three high rises currently under construction in the North Pearl. 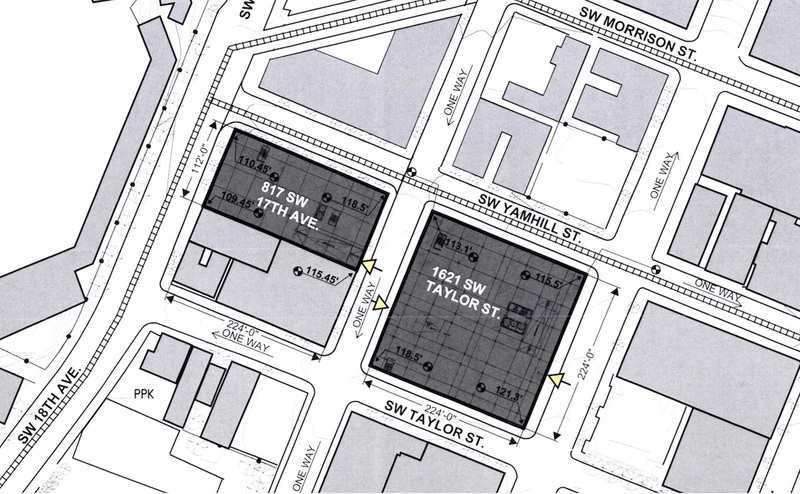 The building at NW 12th & Overton is composed of two distinct forms, divided by a semi-public courtyard: a five story low rise building on the eastern half of the block; and a 16 story tower on the western half. Between them, they will create 281 rental apartment units. 210 vehicular parking spaces will be located in a below grade garage. 422 bicycle parking spaces will be provided, with one space in each unit, and the rest in a secure storage room. The building’s design is by Boora Architects for Hoyt Street Properties in partnership with Atlanta-based Wood Partners.